Gregor Fisher's return to the stage after 25 years... as a Granny! Glasgow's Graffiti sensation, Rogue One makes his mark. Writer and artist John Byrne reflects on life as a Renaissance man. 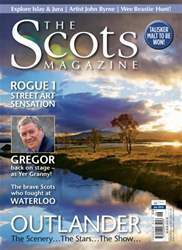 Plus Dame Evelyn Glennie's new dream, on location with time travel epic 'Outlander', and the author of the books reveals her inspiration, and we visit Islay & Jura, Torridon, the Pentlands, the Nevis range, and more.